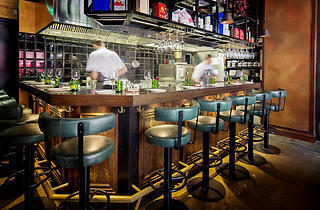 The latest wine bar and brasserie from Jason Atherton, near Selfridges. 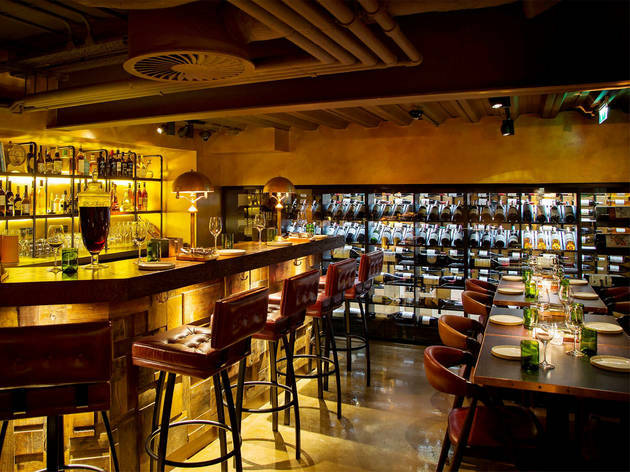 When Jason Atherton, one of London’s leading restaurateurs, opens a wine bar next to Selfridges, you take notice. And employing Jason’s wife Irha as the venue’s manager suggests that the Athertons’ investment in this project is personal. Yet it was the personal touch that was conspicuously lacking on our visit. Although it’s styled as a wine bar, everyone was tucking into full meals: a smart decision, because the food is terrific. The Josper grill sears colourful vegetable assemblies, the deep-fryer turns out a lip-puckering salt and pepper squid, and poached egg with oxtail was a triumph of texture and flavour. So why are we hesitant to endorse it? Because food is only one part of a successful meal out. On arrival, you may well have to wait for a table. Good tapas bars, such as Barrafina, let you nurse a glass or perch on a seat while you’re waiting; here you’re confined to the entrance. It’s about as much fun as waiting to go through airport security. On being seated we had three separate very long waits: to be given menus, to have our orders taken, and to pay. In fairness this was recognised, and the manager gave us our drinks free by way of apology. But the problem wasn’t the place being too busy; it was training, and systems. The staff simply didn’t seem to know how to wait tables effectively. There is a great, wide-ranging wine list, but few staff, if any, appeared able to tell us anything useful about it. We were not warned that a Spanish white, costing £11.50 for a small glass, was a ‘natural wine’. It smelled and tasted like cider; we had to send it back. A good wine waiter warns you first. We enjoyed the food a lot, and would have ordered desserts, but we simply couldn’t face another hour of trying to flag down inattentive waiters. So we went home hungry instead. Let’s hope they sort out the service here soon, because the outstanding food deserves far better. 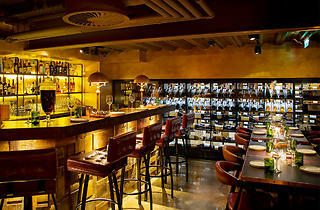 Social Wine & Tapas is Jason Atherton’s restaurant, bar and wine shop on James Street, Marylebone. Executive sommelier Laure Patry has created a dynamic wine list offering quality, and rare and fine wines sourced from around the world, alongside modern tapas from head chef Frankie Van Loo. Meal for two with wine and service: around £80. Booked into this place for a last minute dinner/drinks on a Thursday and it was easy to see why it was packed. An extensive wine list ordered by country had us off to a good start before finally getting to the full list of tapas. Each dish was different and delicious and good portion sizes considering it is a "tapas" menu. We ordered roughly 4 dishes between 2 (definitely try the grilled eggplant, and the lamb) and then finished with dessert and coffee. Thoroughly enjoyed it and will be going back to try more - only it won't be too often as the menu was a little pricey! High expectations for this place considering it's Jason atherton. Booked a table online hence avoided the queue. The staff were friendly and knowledgeable about wine. Love the ambience, definitely a place for romantic dinner. Food was good and special as expected, never eaten any similar tapas like here before. Desserts is a must, they were absolutely stunning. £30 for a Jason Atherton tapas tasting menu? Er, yes freaking please. 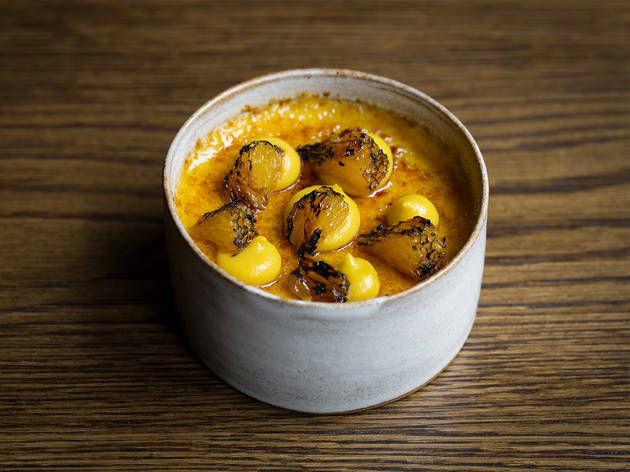 Gordon Ramsey’s previous Executive Chef has had a stellar career since he branched out from under his mentor’s shadow and became a recognised chef in his own right, and Social Wine and Tapas is another jewel in his crown. 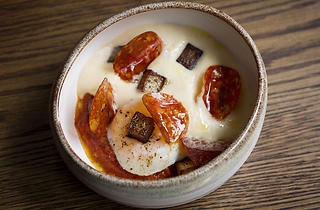 This trendy eatery just off Oxford Street is offering up delicious tapas dishes with an impressive wine list to match. 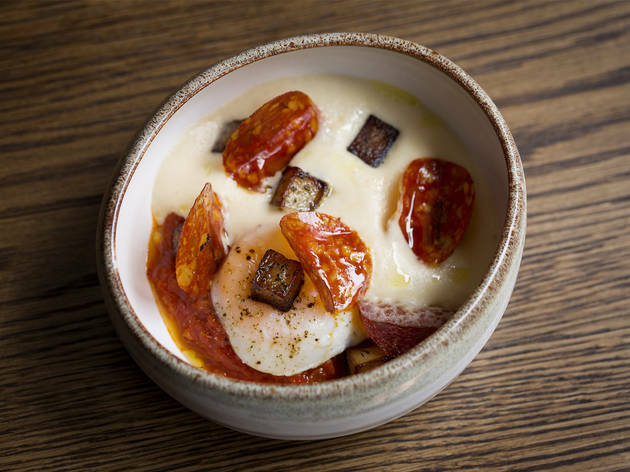 The set tasting menu is such great value- seven incredible tapas dishes which show the variation in flavours, ingredients and textures on the menu for thirty pounds. The food is beautiful; subtle miso salmon tartar, crispy croquettes with super smooth potato and smoky ham, fresh, zingy calamari with sweet peppers and for something a bit more hearty, the veal sliders topped with tender pulled pork were juicy and delicious. And to finish it off- a delicate dessert of grilled tangerine will cleanse your palate. However this restaurant is called Wine and Tapas, and you must try one of the hundreds of different varieties of wine they have in their wine list, which is more the length of a novel. There is wine from the regular spots, France, New Zealand, Italy- but there are some more exciting varieties on offer, such as bottles from New York and Syria. Whilst some of the prices are eye watering, there are plenty of options for a slightly more reserved budget (we had a cracking bottle of Sauvignon Blanc for £20-job done). With wooden décor, cosy lights and helpful and friendly staff, this is the perfect place for a Friday night date or catch up with friends. Great wine, even better tapas. Social wine and Tapas is fantastic. 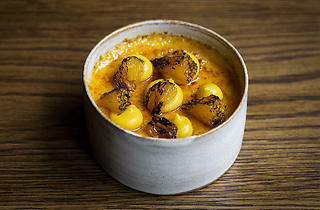 The best Tapas I've had in London, the dishes were inventive and delicious. Lovely restaurant atmosphere and helpful staff. Definitely go here if you are in the area! The food is excellent and the wine even better. 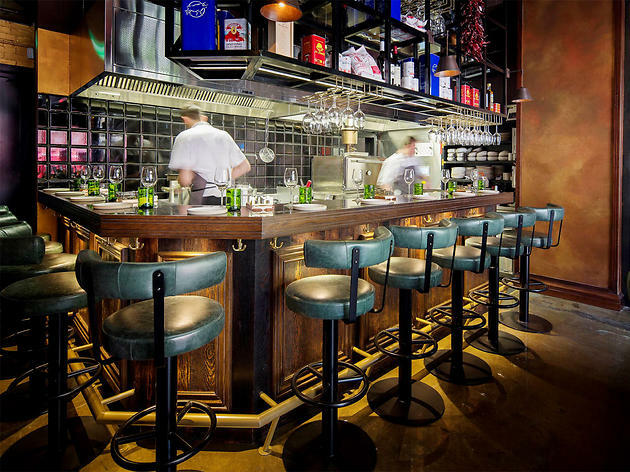 Social Wine and Tapas follows the uniform of the other Jason Atherton empire of restaurants. It is filled with dark wood, but with some cool eat at the bar and kitchen areas. When you first walk in you are hit with a library of wine books to buy, followed by the dark wood layout and then there is the amazing glass displays. There is such a great choice of glasses and glass decanters on show. The food was excellent, the tapas is simple but amazing. The ham croquettes are like a little piece of heaven, and more than two portions were ordered. the Spanish breakfast, patatas bravas, chorizo was exceptional and is done a little different than normal patatas bravas. star of the show was the Rose veal & foie gras burgers, pulled pork, avocado, pickled cucumber. The last in the burgers was really good and more were ordered. The wine selection was 2nd to none for a restaurant like this, the wine list is extensive with great range of new world and old world wines, the wine waiter was very helpful and definitely choose the right wine for the table's pallets.